A group of frat boys, sorority girls, and a goth girl/ex-friend of one of the sorority sisters decide to check out their towns old burned down and abandoned convent. This convent was the site of a mass-murder of nuns and priests by one of the students who attended school there. Unbeknownst to the kids, because of the tragedy, the local satanists have made it their favorite place for them to preform their rituals. Goth girl Mo (Megahn Perry) is taken by the satanists and used in a sacrifice to try and summon the forces of darkness. 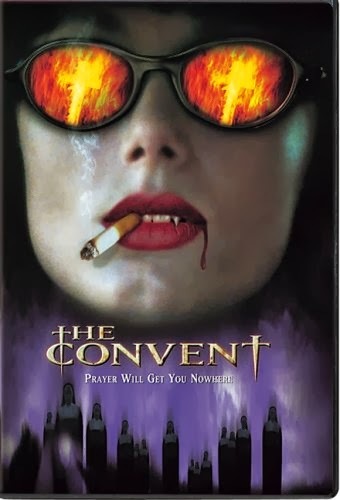 "The Convent" is a wonderfully stupid and silly B-movie. It's full of blood-splattering gore and silly comedy. Any movie with Coolio is going to be a good movie, wait, scratch that: any movie where Coolio plays a cop and maintains his Coolio hair is bound to be a good movie. The script is pretty bad, the dialogue is outrageous, and the acting is terrible and overdone, but that makes it hilarious and fun to watch. It definitely felt like a late 80's-early 90's type of movie, even though it was made in 2000. It's a good film for fans of low budget horror comedies and/or B-movies in general.